We tend to forget that for every beginning there is an ending. When we are reminded, it can be difficult to cope with the feelings that the reminder brings with it. In weaving there are lots of beginnings and endings. Warps end. Thread ends. Shuttles empty and need to be filled. Projects come to completion and we are either satisfied with our results...or we are not. Endings can be fraught with emotion. 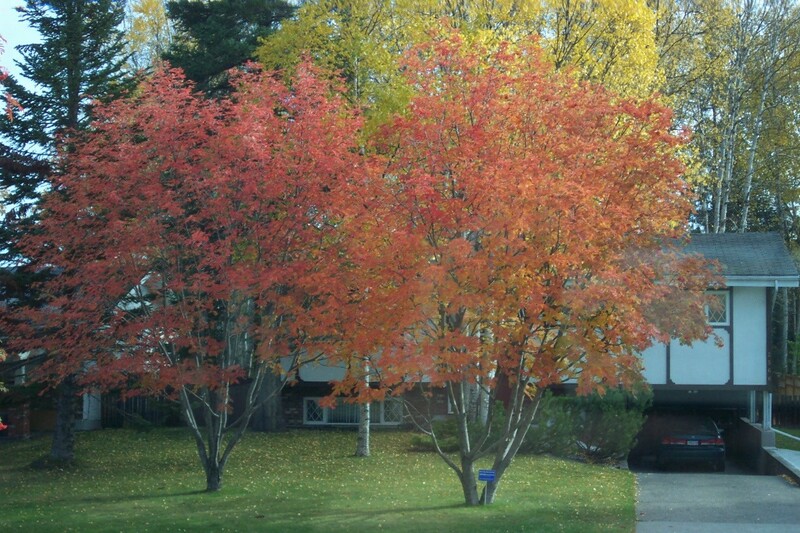 As we head into true spring life has served to remind me that there are also endings. Spring rolls into summer, which rolls into autumn and then...winter. But as life is a cycle, there is hope. Spring comes again with the promise of new life. A friend has goats and they are popping out babies. Chickens are laying and hatching. Trees are beginning to leaf out and there are little hints of green showing up in my 'flower' beds. I have not done as much as I intended - or hoped - over the winter. But the current warp is significantly reduced and I'm down to about 7 or 8 more of the navy towels to weave. That yarn was way thinner than the turquoise and therefore wove a lot more yardage! But that cone is now empty as all the navy yarn is wound onto bobbins, currently steeping to make them more co-operative. I'm already planning the next warp. It was supposed to be a shawl warp, but I'm determined to get this fine linen woven up. Besides, I think weavers will be more inclined to treat themselves to a half linen towel than a shawl - those are mostly intended for the autumn craft fairs, anyway. Early bird registration for the conference has ended, and while we will gladly accept 'late' registrations tonight we need to make some decisions. Better get back to crunching numbers. One of the challenges in the Olds curriculum is that of weaving double weave, both double wide and double width. The top sample was woven by one of my students, the lower one by me. 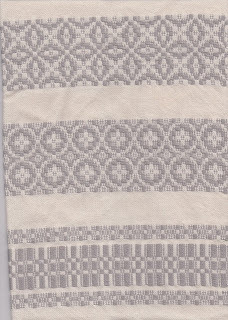 The fold in each of these textiles is visible in the photo. Well, that's the point. It isn't visible. One can speculate where it might be, but in real life? It really isn't visible and the only way I can tell where it actually is? I need to fold the cloth in half. Recently I read a discussion on line about how horrible weaving double width is, that it is impossible to ever get a decent fold and it's essentially a mad waste of time for anyone to ever do it. I'm here to say it can be done. I show proof that I'm not the only one who can do it. In fact several students this year completely rocked the fold but their homework has been returned. This one will be returned to the student at the conference. I'm hoping she will allow me to display her work during the seminar on the Olds program. But I have to ask first, and I haven't, so I'm not saying whose it is. I'm sure that if she reads this blog post she will recognize her work. Even if you can't get the fold 'perfect', there are ways to disguise it. In the upper photo the fold shows one way to partially disguise with the colours of the stripes, plus a really nice fulling of the wool yarn. Although I think she was playing it 'safe' because even without that, the fold was invisible. In mine, the warp was 2/16 cotton, 36 ends per layer for a total of 72, and the weft was linen 20 (I think - it's been a while) There was no 'disguising' the fold. 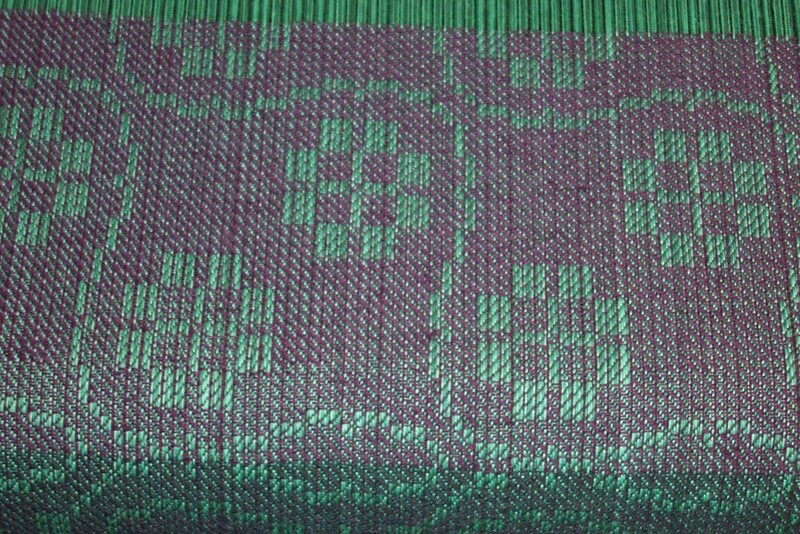 I've mentioned this project previously and the best I could do weaving this cloth was 9" per day. Because every shed had to be checked, and two of the four routinely cleared, then the fold had to be very carefully laid in. This warp was a once in a lifetime project. And I do not regret doing it. One of the things I find challenging, yet very satisfying, is to mark the homework for the Olds College master weaving program. Have I done a good enough job explaining things? Have I given them good information? Of course there are times when very experienced weavers take the class(es) and I don't feel like I offer them very much. But perhaps they, like me, wanted to 'test' themselves to see if they really know what they think they know. I have been blessed to follow one group through two levels. Now many of this group were already very well established weavers and it was a challenge to discuss principles with them on a much deeper level. But that forced me to dig deeper into my own foundation of knowledge/experience. After teaching this program for a number of years I feel that I have grown, not just as a teacher, but as a weaver. When I look back (hindsight is so accurate?) I feel that my health issues began to become critical in 2006. That's almost 15 years (more because I only became aware of the symptoms then - when I think back they were there for at least another 5 years, just weren't really adversely impacting me) of a slow leak of energy. Major surgery, then a recurrence of the cancer the past few years, has just served to drain my reserves even further. 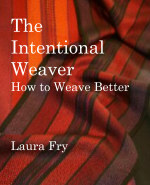 If I can do one thing in this life, I hope it is to encourage weavers to learn more. To change their minds when they find that is appropriate. To explore. To expand their horizons. I do my best to support those who are less experienced and to challenge those who already are, to do better. Aim higher. Dig deeper. I have caught up on the current harvest of boxes of homework. I know there are more to come. Several have had Life Happen and they are either changing which class they go to next or taking a gap year to continue to work on what they have learned. If nothing else, I hope that people feel that they have benefited from the class(es) and feel more confident in proceeding. There are levels, and then there are levels. 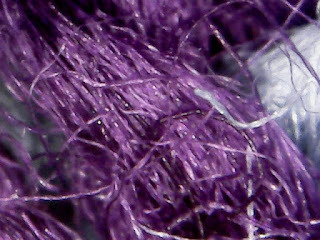 The above is an enlarged view of a two ply yarn of cotton and linen - or as it is sometimes called 'cottolin' or 'cotlin' or some variation thereof. The thing is, if you look at this yarn from a 'normal' viewpoint, it looks like a perfectly standard fairly smooth yarn. When you see it very close up, it doesn't look nearly as neat and tidy. This would be a metaphor for me, right now. After years and years of cramming one more thing, one more deadline into my life, my schedule, neatly jockeying my way through the morass of obstacles and hurdles, I find myself frazzled. Now I'm no stranger to the feeling - just that I'm finding it harder to cope, emotionally, with the whole ball of wax, the tangle. The past few years have left me - apparently - depleted in the energy resources department. So today I find myself ignoring everything save the things that have gone pear shaped and/or critical. I find myself sitting in the chair in the window ignoring everything else. Today I had lunch with a friend - one of those slightly older women who mentored me during my early years that I referred to recently. I found myself telling her that I'm looking forward to 'retirement'. That 'semi-retirement' didn't seem to be working very well. That I am looking at the calendar and counting down the days to the deadlines (ahem) looming and looking forward to having them behind me. At looking forward to getting by the next set of critical conference tasks so that we can figure out what needs doing next, and by when. Then, like the true friend that she is, she asked, what can I do? How can I help with the conference? So we talked about a few things and we found a job that is perfectly suited to her, so there is one thing that can be handed over to someone who will do as she has promised and take that little bit of weight off my shoulders. Our female friends are the 'sisters' we have chosen for ourselves. I don't have a biological sister, but I have been blessed with a large number of chosen sisters. Thank you - all of you. I love you all, more than I can say. Interest in weaving as a craft waxes and wanes. I started weaving in the mid-70s when weaving was in an upsurge. I found myself in the midst of a group of (mostly) women who were intrigued by the craft and the unexpected nuances that could be discovered in the exploration of the craft. Four of them dove into the Guild of Canadian Weavers master weaver certificate and with the excitement of discovery and challenge the program provided I was inspired to begin the program myself a few years later. Three of the four continued on to achieve the final level and certificate and all were supportive of me as I started the program myself. When I flagged they encouraged me to get back at it. They wanted to see my explorations and when I passed a level, they oo'd and ah'd. When I finally(!) passed, they gifted me with a lovely book by Jack Lenor Larson "Material Wealth". I always taught, right from the beginning. Weavers who had kept the craft alive during the down part encouraged me and others to pass the knowledge of the craft along. For those too shy to teach classes, the encouraging phrase was 'each one, teach one'. Today I spent another couple of hours at a local high school. The teacher said she had 6 or 8 students on her list but only three showed up. Two could only stay for one hour and then had to leave. The third one? I left her with the guild table loom and a warp she had wound for a scarf. In the two hours we talked a bit about tapestry, then I showed #3 how to wind her warp, then we beamed the warp together and I showed her how to thread. There weren't enough heddles on the first four shafts so instead of just using four shafts, I showed her how to thread a straight draw over all eight. When you are new, there are no preconceptions that 8 shafts are any more difficult than 4. It's all just a mysterious blur no matter how many shafts are there! So I don't tell beginning weavers that they shouldn't use 8, I just get the loom set up and get them started. There wasn't time for her to finish threading before next class, so we talked about when she would be available and it turned out that Friday morning she didn't have any classes so her homework is to finish threading the 200 ends by 10 am Friday. She says she likes the detail of the process and we talked about weaving being a working meditation. That frequently I go to the loom precisely because I'm frustrated with the way Life is Happening and I go to the loom to centre myself. If we can get her equipment, I think we may have found one more. Maybe she will teach one, too. I have been slowly, thoughtfully, chewing my way through The Golden Thread by Kassia St. Clair. This morning the paragraph beginning "While it is often assumed..." stopped me cold. What she is saying is that the people who were captured, brutalized, de-humanized, were in large part put to creating the trade goods that would send slave traders to Africa to capture and enslave more people. Quote is on page 169 of the book. Ms St Clair provides lots of footnotes and citations for anyone who wants to research further. There is a myth that Europeans were 'civilizing' the people living on the African and North/South American continents, when in fact all continents had indigenous peoples with highly complex civilizations. There are many books that expand on those civilizations. While we don't know what we don't know, there are plenty of resources out there that are available. Choose books that don't espouse the 'white savior' complex, or attribute ancient artifacts to aliens. A threading draft is just a set of pre-programmed options which may be executed in a variety of ways. The above photo is a sampler I did for the GCW master weaver certificate. I covered this more extensively in The Intentional Weaver so I am just going to cover a few points. Not every overshot draft can be effectively converted to 'rose'. If you look at the above photo, the top design has very strong diagonal lines running through the entire motif. The middle sample, has very strong circles in the design - the 'rose'. The conversion can also be 'tricky' because the treadling sequence depends on exchanging blocks in the design. This can be done by not changing the tie up and treadling it, or by changing the tie up and following the 'star' (traditional) treadling. But the underlying threading has to be able to exchange those blocks to create the circles or 'roses'. It is possible to take a 'rose' threading (M. P. Davison has a section on rose designs) and convert them to a star, too. An overshot threading can be woven in other weave structures. 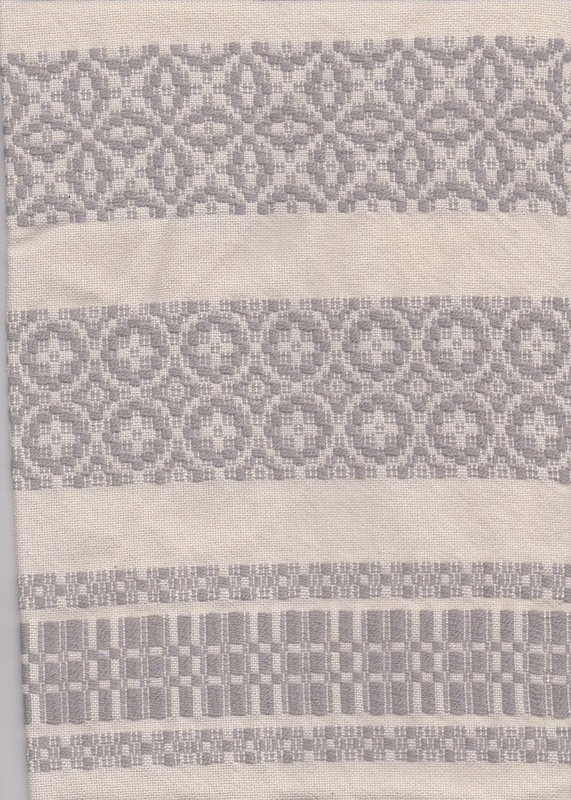 If the design has small units/blocks, it can be woven in a 2:2 twill, lacey, honeycomb along with others. Overshot is characterized by areas of floats (generally considered the design/motif), half-tones and plain weave. 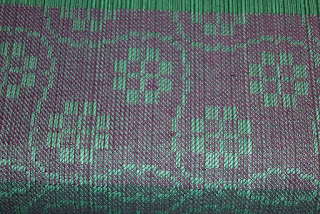 Larger sized designs may have very long pattern floats, so sometimes the pattern float is tied down so that there is no plain weave area as such, but only the floats and half-tones. I frequently use the traditional Snail's Trails and Cat's Paws motif for tea towels. It's a fairly large motif which has a strong graphic look to it. The warp on the loom right now is the Canadian Snowflake twill (derived from the 8 shaft Swedish Snowflake into a four shaft twill) which I converted into twill blocks. Once someone understands the potential in a threading draft, they can play with it and manipulate it to create unique textiles.